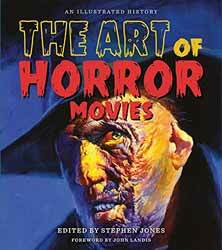 The moment I turned the first main page of this book I was met with an impressive full-page pallet oil painting of the Boris Karloff Frankenstein monster. Even better, we have a list of the 58 featured artists and, opposite, a quite stunning Creature From the Black Lagoon in acrylic and oils by Drew Struzan. This is even before entering the main body of the book. The volume is divided into nine chapters covering the silent movies period to recent years, each with a potted history feature by recognisable names. So we have 'The Sinister Silents' (Sir Christopher Frayling), 'The Thrilling Thirties' (Tom Weaver), 'The Frightening Forties' (Barry Forshaw), 'The Fearsome Fifties' (David J. Schow), 'The Stylish Sixties' (Kim Newman), 'The Satanic Seventies' (Jonathan Rigby), 'The Evil Eighties' (Lisa Morton), 'The Nasty Nineties' (Anne Billson), and 'The 2000s Maniacs' (Ramsey Campbell). But this is about the artwork, and there’s plenty of it. Standout examples include a Wes Craven and Freddy Krueger cover for Dark Side magazine by Rick Melton, a crazy psychedelic oil painting of Edward Scissorhands by Nicky Barkla, a stunningly good acrylic of Chucky from Child’s Play by Jason Edmiston (and an equally nice Michael Myers by the same artist), Vincent Price from Madhouse looking suitably menacing by Basil Gogos, and another Price from Masque of the Red Death by Frank Kelly Freas, a quite lovely oil portrait of Hammer regular Michael Ripper by Les Edwards, The She Creature by Vincent Di Fate, a quirky tribute to some of the 1950s B-Movie classics by Doug P’gosh, and a boy’s cinema reaction to that unforgettable moment in The Man Who Laughs by (again) Les Edwards. There are also some montages such as the lovely graveyard scene featuring Dracula, Frankenstein’s monster, Bride of Frankenstein, the Mummy, the Werewolf, the Invisible Man, Phantom of the Opera, Creature From the Black Lagoon, King Kong and many more (this one by Doug P’gosh). These are just a fraction of what is on display. Many styles of artwork make this a very balanced representation of the genre and many decades covered. It’s interesting to study the many film posters; most are great examples of the respective era, and some are crazy cartoony images which bear little resemblance to the film being promoted. Most of this stuff is incredibly sophisticated and detailed work which can only inspire multiple wows of appreciation. True fans of horror through the ages cannot fail to treasure this beautiful book. Buy it if you can; you won’t regret it. I can’t recommend this highly enough.